Location: 470 Park Avenue South (Between 31st and 32nd Streets), New York, New York, U.S.A. Description: Referred to as the Silk Clock, this clock is easy to miss in midtown. 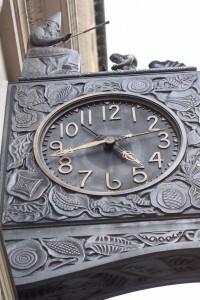 It is perched above the entrance to the Schwarzenbach Building and is constructed of bronze. The bronze skin is skillfully wrought to show, among other things, Mulberry leaves around the face (a favorite food of the silkworm). 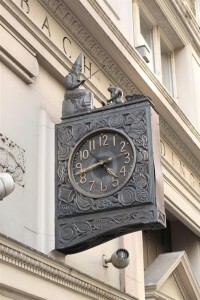 Above the clock face and surround, there is a grouping of figures. The figure that looks like a wizard is Zoroaster, “the mastermind and doer of all things” and he is adorned with Zoroastrian symbols. At his feet, lies a cocoon and past that, a “slave” who is meant to represent the “primitive forces and instincts of man” where he appears as a blacksmith, hard at work with hammer on anvil. mechanical, and stymied by the city’s filth), Zoroaster waves his wand, the blacksmith rises and hammers upon the cocoon, and the elegant “Queen of Silk” emerges from the cocoon holding a tulip until the hour has passed. 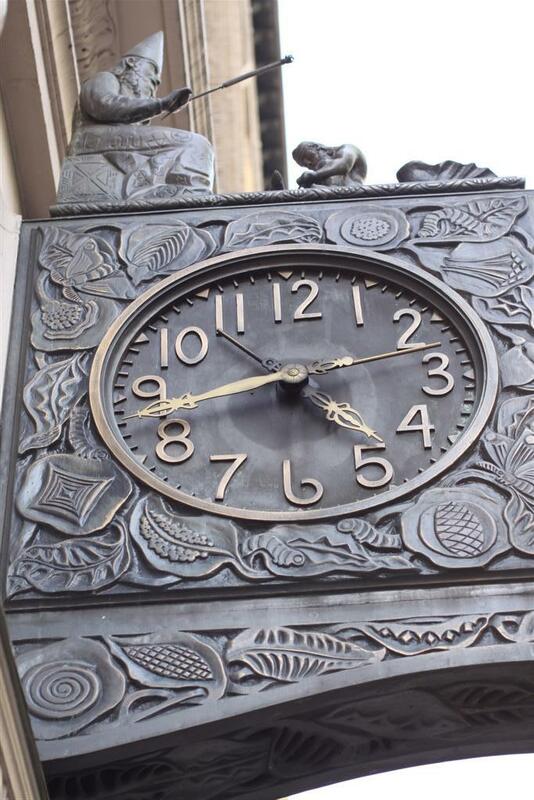 The symbology of this amazing clock, combined with the terra-cotta figural moth surrounds (designed by the clock artist’s wife-Marguerite Thompson Zorach) point to the importance of silk for this building’s original occupants. Beginning in 1888, New York City was a major center for the international Schwarzenbach silk house. …Check out their latest Canstruction entitled “CAN on the Moon”! If you believed they put a CAN on the moon, CAN on the moon. If you believe there’s something FISHY, then here’s something for you. Who said tuna CAN only swim? That’s one small step for a CAN, one giant leap against Hunger. This structure’s 4,200 cans will feed 1,544 New Yorkers.